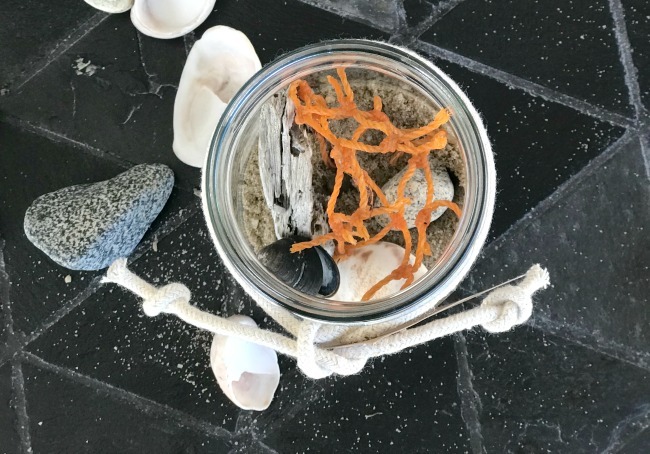 Before we left I found a great summer DIY project on Pinterest using sand and shells in jars. If you don't already follow Homeroad on Pinterest please do, I have over 2 million monthly visitors and I pin a lot of great projects! This was the best idea ever for a family project and makes a great take home souvenir for kids and grown-ups alike. I love the ones made by homewardFOUND. 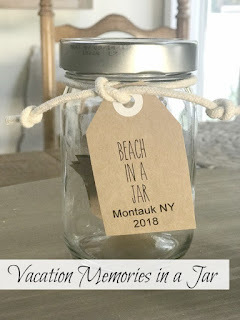 I started with a few clean jelly jars, a few lengths of cotton string and a card stock tag with the vacation destination and year. The idea is to have the jars ready to go and fill them with all kinds of beach finds from your vacation including shells, sand, rocks, and treasures. I brought along one jar for each family that went with us. 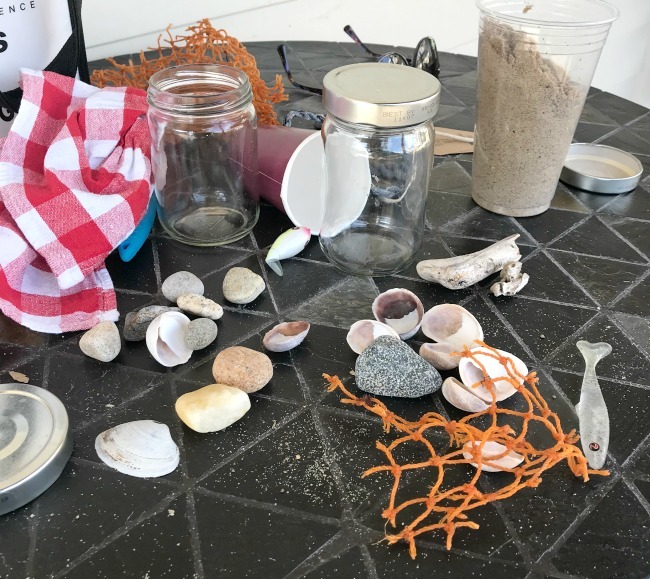 After we were there a few days we dumped out all of our beach treasures and filled the jars. Each person found many things that were memorable especially to them. 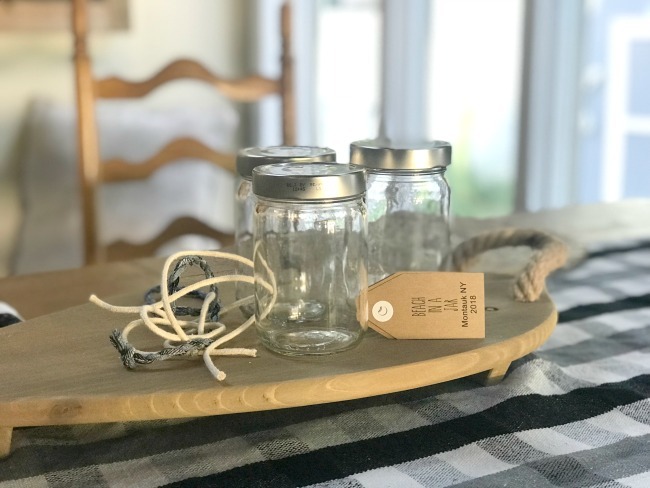 We used a long stick to arrange the treasures in the jar. The jars were assembled in no time and could be added to throughout the vacation. You can even insert a photo from the vacation along with the many treasures. It was sad to see how much garbage people left on the beach and how much washed up each day. Plastic straws, balloons, and plastic bags are a big problem! Someone on the beach even thanked us for picking up garbage, no thanks necessary, we felt compelled to do it. If everyone would pick up a few pieces of trash each time they visited the beach, our world would be a cleaner place. Yes they do Cheryl! I love the coast of Maine... we visit up there sometimes and it's beautiful near the NH border. Super fun idea and great one for kids. 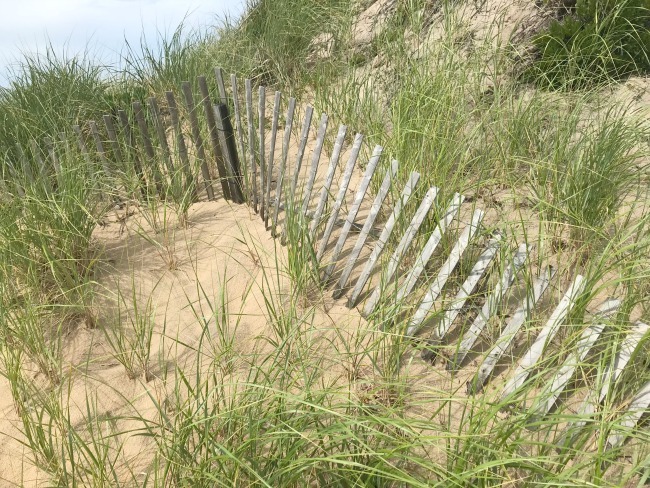 We are finishing up our beach vacation right now so this is a great place to store all the shells they are bringing back. Yes ! The kids would love it! Even the grown-ups were excited to find unusual things to save in the jar! When kids were little, we'd go to the beach in the early spring (bringing hot soup and cocoa in thermoses! 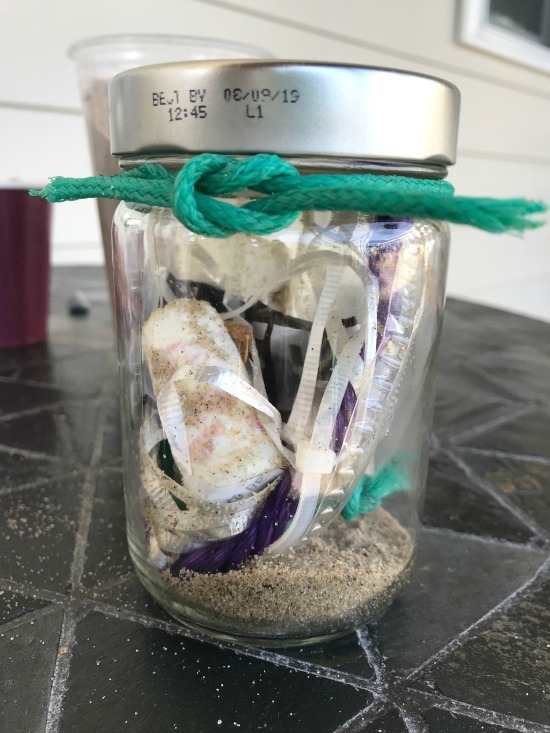 ), pick up trash and bottles (5 cent returnables, and a few ocean treasures before the tourists found them. 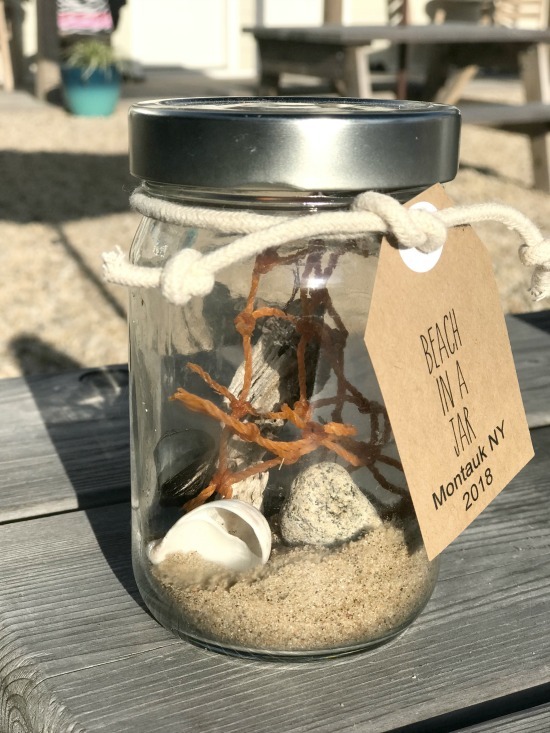 If everyone did a bit, the beach would be clean, birds and fish wouldn't die being trapped in plastic things, and it would be a more beautiful world. We live near the coast of Maine; it's where I go to get centered! 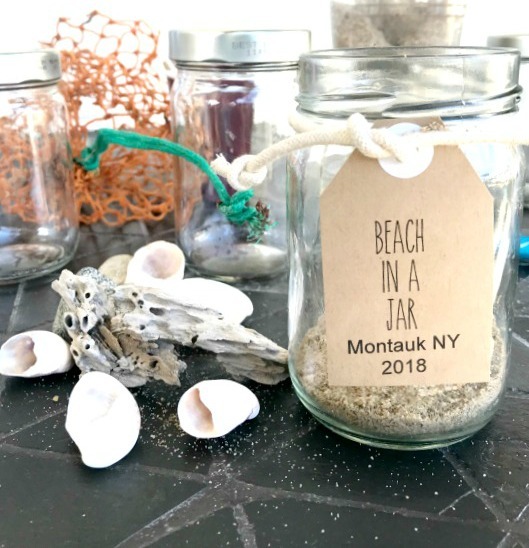 I make clear glass Christmas balls with "store bought" stuff and always add a few Maine shells and a bit of sand; its like shaking a snow globe; addicting. That sounds wonderful! I love Maine and the shell ornaments sound beautiful!